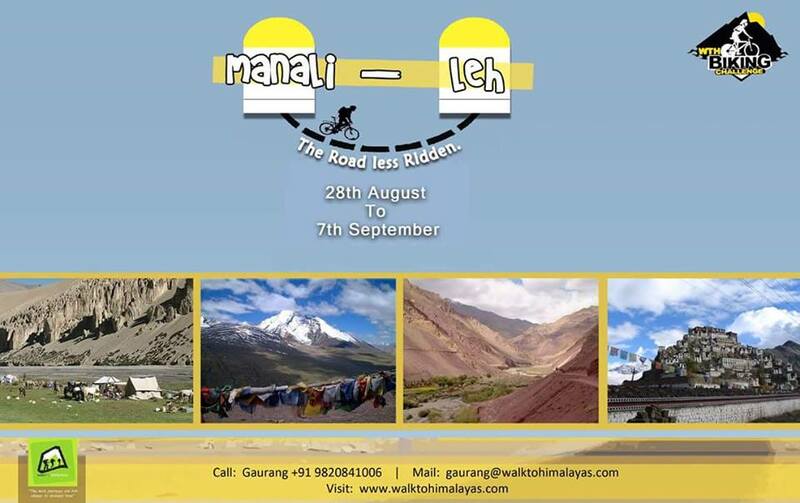 Day 1 : Manali - Marrhi Nallah- 40 Kms. Day 3 : Tandi - Keylong - Gemur - Jispa - Darcha - 45 Kms. Day 4 : Darcha - Patseo - Baralacha La - Bharatpur - 55 Kms. Day 5 : Bharatpur - Sarchu - 4253 M - Brandy Nallah - 35 Kms. Day 6 : Brandy Nallah - Gata loops - Naki la - Lachungla - Pang - 57 Kms. Day 7 : Pang - More Plains - Tanglangla (Base Camp) - 47 Kms . Day 8 : Tanglangla - Rumtse - Gya - 50 Kms. 1. 10 night accommodation in standard room / tent at specified hotels or similar. 2. Stay as per meal plan specified above. Meals will be buffet breakfast and dinner at hotels /camp and lunches (wherever mentioned) while cycling will be picnic style (Packed). 3. Transportation by NAC Innova or Scorpio for departure transfers at Leh airport. •	Kitchen equipment like cooking utensils, camp crockery, tableware, lamps, wash bowls and cloth linens.